EuroCup Women - What is happening? 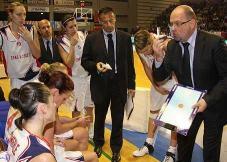 On paper the EuroCup Women competition format is easy to understand. The first two teams from each group qualify directly for the sixteenth-final along with the eight best teams that finish third. FIBA Europe had based these rules on having 48 teams split into 12 groups of four. Unfortunately 48 teams did not register for the competition this year and after the draw was made teams dropped out. So in the end this competition finished with 2 groups of 4 teams and another 2 groups with just 2 teams, while the remaining 8 groups had 3 teams. Based on the rules, the teams in the group of 2 have already qualified for the sixteenth-final and are just playing games for the ranking position. Group H and I are the the only groups with four teams and already Vagos and Olivais Coimbra are eliminated because they will finish in fourth place. This leaves us with 10 teams who will finish in 3rd place fighting for the remaining eight places. HATIS Yerevan are one of five teams without a victory in third place. Hatis have completed their programme and now have to wait on the results from the other teams to see if their -69 point difference will allow them to qualify. Meanwhile Arras has joined Nantes Rezé and Villeneuve d'Ascq in the next phase of the competition. Rima Margeviciuté played for COB Calais during the 2006-2007 season. She is now playing for Lemminkainen in Lithuania. Margeviciuté, like her team-mates chose the right time to play their best game of the competition and notch up victory number 1. They beat Zeljeznicar (79-48) and are now sure of finishing second in Group A. Margeviciuté scored 13 points and pulled down 9 rebounds. Lucie Bouthors had to watch from the sidelines as her side Besiktas JK fell at home (63-71) to Partizan Galenika despite 21 points from Iziane Castro-Marques. Elsewhere there were no surprises but some solid performances from top players in the competition this season. Belarus international Natallia Anufryienka (left) scored 20 points for BC Horizont in their road win (78-46) against SCM-CSS Craiova. Italian international Kathrin Ress went 7-of-9 from the field in compiling 19 points for Gran Canaria in the victory against Szeviép (84-48). Shay Doron from Israel poured in 20 points for Elitzur Ramla in the win against HATIS Yerevan (79-61), while Abisola Olajuwan compiled a double double of 14 points and 15 rebounds in less than 21 minutes for Seat Györ in the win against Saarlouis Royal (69-51).